You can use the SmartVault Inbox to quickly scan and upload documents into the SmartVault client portal. With the SmartVault Inbox, you can quickly scan and upload documents (up to 2GB) into the SmartVault client portal where they can be further processed by an accountant or bookkeeper. Accountants love using the SmartVault Inbox with their clients because it is simple enough for the clients to use, increases efficiency, and reduces the burden of scanning. For example, let's say that your company has created a file structure where each employee in the sales department has an Expense Receipts folder. Each employee is responsible for scanning and uploading all of their expense receipts into their Expense Receipts folder by the end of the month. At the end of the month, the bookkeeper reviews the employee receipts, then attaches the electronic receipt to the appropriate QuickBooks entry. 1. 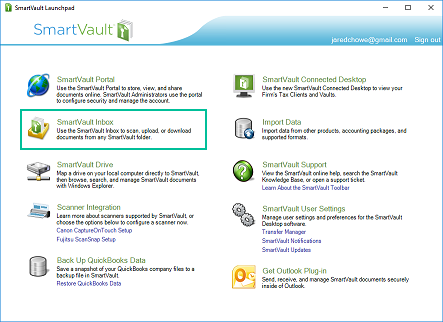 Install the SmartVault Desktop software. Note: For more information, see Installing the SmartVault Desktop Software. 2. Sign into your SmartVault account. 3. On the SmartVault Launchpad, click SmartVault Inbox. 4. 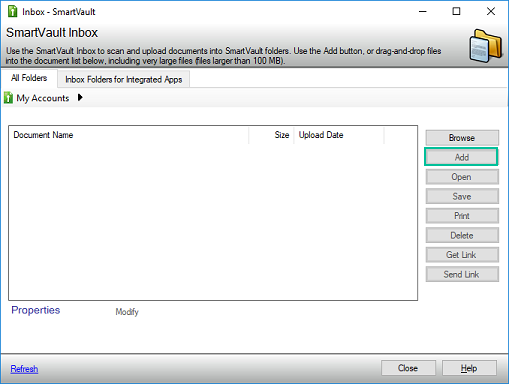 Select the All Folders tab to upload to folders in SmartVault. 5. Click the right-facing black arrows to navigate to the folder where you want to upload your document in SmartVault. 1. From the SmartVault Inbox, click Add. 3. Browse to the location of the document you want to upload, select the document, and then click Open. 4. In the Name field, enter a name for the document. 5. In the Description field, specify a description for the document. 1. Select the document on your desktop or in a drive. 2. 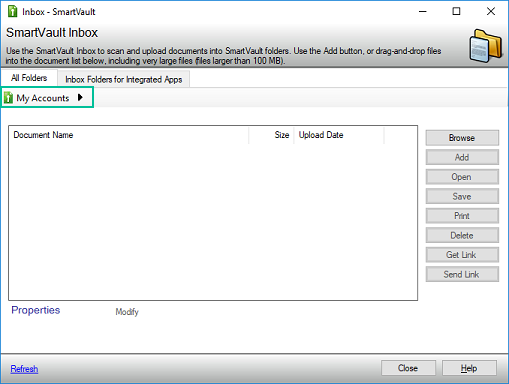 Drag and drop the document into the SmartVault Inbox in the specified vault or folder. 1. Select a document attachment in a Microsoft Outlook email.